There is a best-selling little book titled Everything Men Know About Women. Written by Cindy Cashman (under the pseudonym of Dr Alan Francis), it has been in print for over two decades and contains a ‘profound message in its simplest form’: every page is completely blank. My women friends claim this is the bare truth, but let’s not argue that here. I think of this book — I was once gifted a copy! – whenever I listen to environmental scientists say how little we still know about our home planet. At the recent Rio+20 summit and in the weeks leading to it, many experts reminded us of the limits of our scientific understanding of the intricate and inter-linked natural systems on Earth. We know even less about how 7 billion of us are impacting them. Deferring action until we have full knowledge and understanding is not an option. Today’s ecological crises are real and urgent. Every passing year, we increase our already overbearing ecological footprint – a measure of how much energy and resources we consume, and what waste we generate. It was the American architect, designer and systems theorist Buckminster Fuller (1895 – 1983) who popularised the idea of looking at our planet as a spaceship with a finite amount of resources – and no external supply line. He coined the now familiar phrase “spaceship earth” back in the 1950s (when the Space Age was just beginning) to describe the integral nature of Earth’s “living system”. The situation is serious — but not bleak or hopeless as some alarmists want us to believe. Thanks to research and analysis by thousands of our world’s brightest minds – aided by some of its fastest supercomputers – we do have elements of a planetary manual, albeit incomplete and disjointed for now. It’s not as if all pages in the planetary ops manual are blank. But the question is: can science fill the remaining ‘pages’ faster than the processes of degradation are destabilising the fine-tuned balance of elements and energy? When might we reach the dangerous ‘tipping points’? “Scientific evidence shows that Earth systems are being pushed towards their biophysical limits, with evidence that these limits are close and have in some cases been exceeded,” the UN Environment Programme (UNEP) cautioned in a new and wide ranging assessment released in early June, on the eve of the Rio+20 Summit. The fifth edition of the Global Environmental Outlook (GEO-5) was produced over the past three years. It was a multidisciplinary effort that involved some 600 experts worldwide who analysed data from every continent to build up a detailed – even if incomplete — picture of the planet. The report says that if humanity does not urgently change its ways, several critical thresholds may be exceeded, beyond which abrupt and irreversible changes to the life-support functions of the planet could happen. GEO-5 builds on other recent assessments. 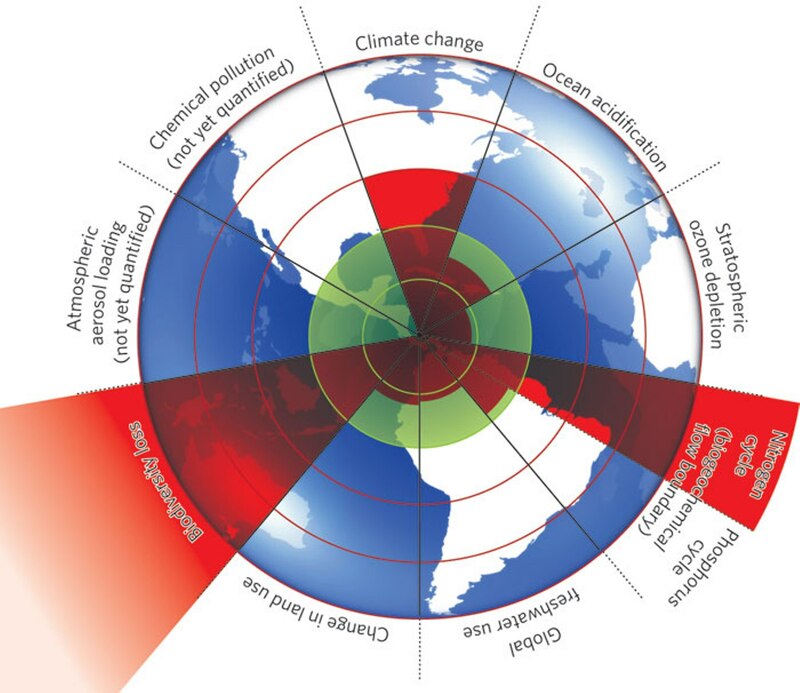 In September 2009, a group of leading Earth system and environmental scientists proposed some “planetary boundaries” to define a “safe operating space for humanity” as a precondition for sustainable development. They presented their full report to the Club of Rome and published a summary in the scientific journal Nature. They identified nine planetary processes which have boundaries which, if crossed, would risk triggering abrupt or irreversible environmental changes. Using existing data, they placed ‘acceptable’ upper limits on seven environmental parameters: climate change, ocean acidification, stratospheric ozone depletion, freshwater use, biodiversity loss, global cycles of nitrogen and phosphorus, and land-use change. If any one boundary is exceeded, then others are at serious risk of being breached as everything is interlinked, they said. It also published seven independent commentaries from thought leaders in their disciplines to critique the proposed boundaries – igniting a debate that continues. That’s how knowledge advances. Some geologists believe that human activity has so irrevocably altered our planet that we have now entered a new geological age. A decade ago, the Nobel Laureate Dutch chemist, Paul J Crutzen, coined a new name for it: the Anthropocene. It is fast gaining acceptance. ‘Welcome to the Anthropocene’ is a short, non-technical film that introduces the concept. Produced for the International Geosphere-Biosphere Programme (IGBP), it uses data visualisation to show how humanity has become a colossal global force. Starting in 1750 — at the beginning of the Industrial Revolution — and running up to the present, it is a dash through the last two and half centuries during which one species – Homo sapiens – transformed the land, sea and air. Released in March this year at a major scientific conference in London called ‘Planet Under Pressure’, this film is now part of an educational website at www.anthropocene.info It was screened to the heads of state at Rio+20. information needs to be communicated to policy makers and the public. There are no clear or easy answers to some questions, but denialism can only lead to self-delusion. This entry was posted in Biodiversity, Communicating Development, Documentary Film, Environment, Environmental management, Environmental policy, Science Journalism, Sustainable Development and tagged Anthropocene, Buckminster Fuller, Cindy Cashman, Ecological footprint, Everything Men Know About Women, Felix Pharand-Deschenes, GEO-5, Global Environmental Outlook, Industrial Revolution, International Geosphere-Biosphere Programme, Nature journal, Operating Manual for Spaceship Earth, Paul J Crutzen, Planet Under Pressure, Rio+20. Bookmark the permalink.